The words "symphony" or "orchestra" may conjure up images of old barons and artisocrats wearing thick-rimmed glasses and pocketwatches. A sea of people who look like the Monopoly guy or Eustace Tilley. 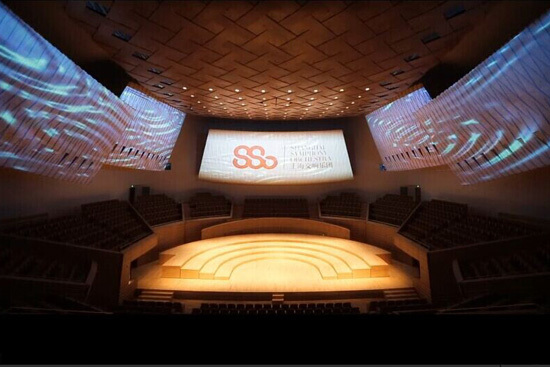 That is not the image the new Shanghai Symphony Orchestra Hall (SSOH) is going for, especially with projects like this Sunday's Moonface show, a partnership between indie promoters Split Works and the SSOH. 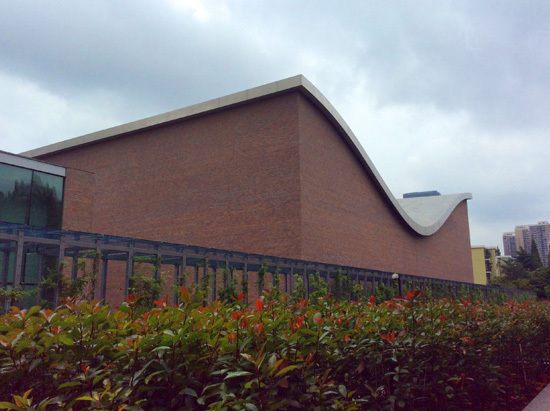 The building, which opened in July, 2014, looks a lot like an indoor swimming pool. That's because it used to be one – the Xuhui Tiaoshui Chi. That closed in 2008, when construction started on the Symphony Orchestra Hall. Pause for a minute to consider how long the average shop or commercial building takes to go up in Shanghai. Maybe a year, tops. Six years is a long time indeed. Aside from swimming pools, people liken the SSOH to a wonton skin, or a saddle. 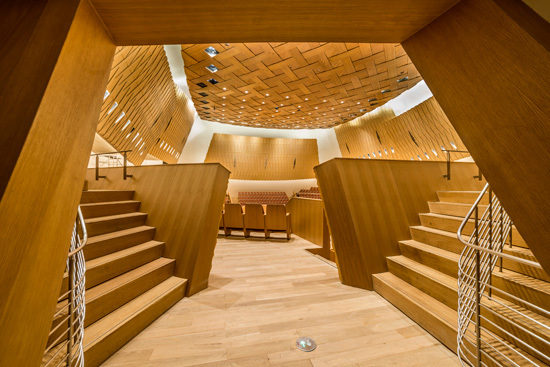 The building was designed by renowned Japanese architect Arata Isozaki, who worked in concert with equally famous acoustic engineer Yasuhisa Toyota. We walked into a practice session with a few violinists in the smaller hall yesterday, and the sound was like a rainbow weeping. Beautiful. High definition, without speakers or cables, just the knowledge that some Japanese guy had painstakingly planned every last plank of wood in that room. The halls themselves sit on giant springs, to protect against the vibrations from the three subway lines that also run underground. 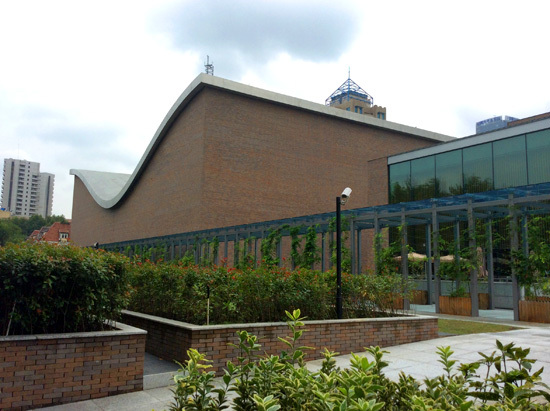 The neighborhood, around Fuxing Lu and Huaihai Lu, is one of Shanghai's more cosmopolitan areas, and they built the orchestra hall to fit in rather than tower above. From the outside, it's incredibly short and understated, but closer examination reveals serious workmanship. I doubt we'll see teams of workers tearing up and replacing those bricks a few years later. Many know Shanghai for jazz and qipao-wearing lounge divas, but the Shanghai Symphony Orchestra (SSO) is one of, if not the oldest orchestra in Asia. Also started by foreign devils; worth pointing out. Even in the darkest days of the 20th century, the orchestra performed every year without fail. These days they travel the world regularly, often earning enough to pay for their flights (imagine their baggage costs). 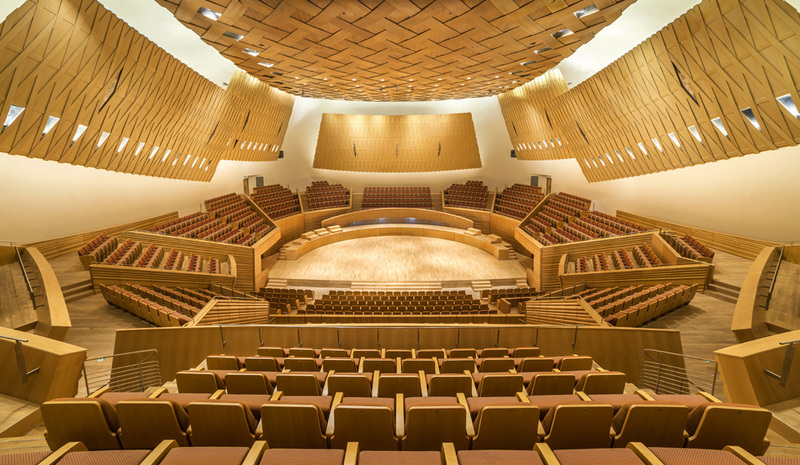 Previously, the SSO did concerts at several venues around Shanghai, which made traveling, practice, and adjusting to different acoustic environments difficult. 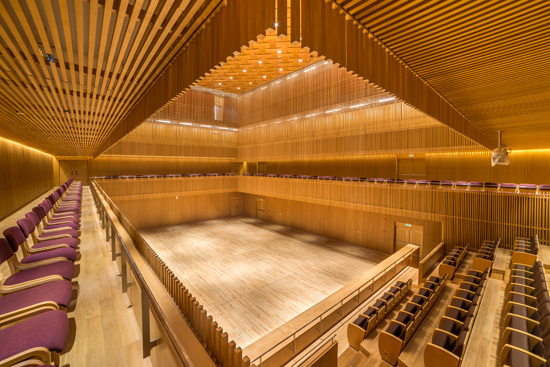 Now they have a home, one that the SSOH claims has the best acoustics of any concert hall in China. October 5: Sir. James Galway, a.k.a. "The Man With the Golden Flute," a.k.a. the guy who plays The Lord Of The Rings on the flute. Conductor for that one is Lawrence foster. 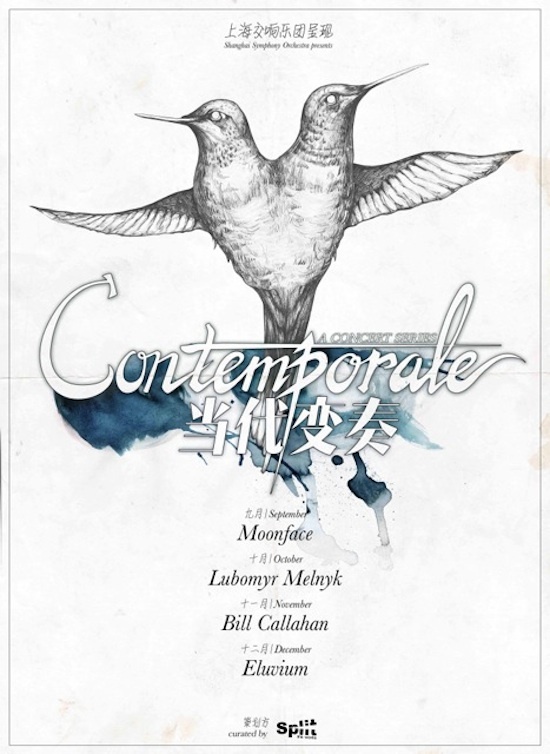 The Contemporale project is one of the coolest projects the SSO is doing. A partnership with concert promoters SplitWorks, they're bringing indie musicians into the venue for a series of intimate concerts, though they will not be playing with the orchestra. This is something new in Shanghai, because generally the big theaters and concert halls are reserved for big names, big promoters, and of course – acrobats. 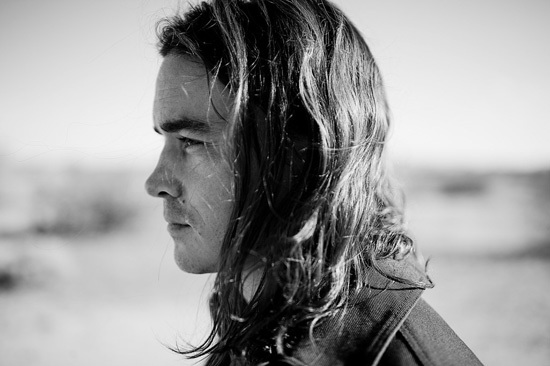 Contemporale starts this Sunday night, with a solo concert by Moonface, a project by Spencer Krug, the industrious head of Wolf Parade, Sunset Rubdown, Frog Eyes, and Swan Lake. I still rate a Wolf Parade show I caught in 2005 in Detroit as one of the best rock shows I've ever seen, so this Sunday should be really good. Commenting on the project, SplitWorks boss Archie Hamilton said "I’ve been wanting to work in some of the amazing theaters that we have all over China (both new and old) but management’s total unwillingness to negotiate ever on price made it fundamentally impossible. The fact we’ve only done two theatre shows in over eight years is kinda tragic, when you think of all the great buildings that Chinese cities have to offer. The support that SSO have shown us has made this possible, and I am hugely grateful and excited." It's a bit of a risk, something the SSO acknowledges. Will the indie kids who turn up to Yuyintang and Mao Livehouse go to a show at the symphony? Perhaps at the age when I saw that Wolf Parade show, I wouldn't have. But now in my late 20s, I'm up for it. The idea is to hook in people who may not otherwise go to a symphony show, and it could work. So the fact that a government-funded institution is willing to do projects like this is another sign that China is stepping up their culture game. We can also see this in the West Bund, and how easy it was for DAFF to work there, and the fact that the Shanghai Symphony Orchestra Hall is located directly in one of Shanghai's more cosmopolitan neighborhoods, instead of near People's Square or over in Pudong. Some of the names that have been discussed for future Contemporale projects are even more impressive. This whole Shanghai Symphony Orchestra project is a good sign for Shanghai. The SSOH is located at 1380 Fuxing Zhong Lu, near Baoqing Lu. Tickets for SSO show starts at 80rmb, with really good seats available for around 380rmb. Guest shows will cost a bit more. Tickets available at the door, and the venue and café is open daily. They have shows every weekend, and some weekdays. Shows generally start at 8pm. More info and schedules on their website.